Do you battle with the removal of persistent stains, water streaks and grime build-ups from your windows? Do they cost you too much effort and you don't want to engage in this chore? This activity will no longer consume a big chunk of your time and energy! The experts of window cleaning in Charlton will give you a hand! You will be able to use your free time as you wish – the trained and dependable experts will take care of the wiping and cleaning. We deliver impeccable cleaning services for all types of windows. Read on and find out more about the different perks you can enjoy. We also provide our professional services in nearby areas: West Finchley, Plashet, Wanstead Park, Herne Hill, Thamesmead. You can depend on the cleaners for both private and commercial window cleaning. All types of glass surfaces are included in our professional routine. For instance, you can get a service for cleaning small or double windows, French doors, sash windows, bay windows and patio doors. Other than these, we wipe and polish garden window surfaces, conservatories and skylights. At home or at your workplace, you can always ensure crystal clear glass surfaces – just contact us! We have the skills and the right equipment for the task. We provide domestic and commercial window cleaning by using advanced techniques. You can rely on our skills for all types of glass surfaces, skylights and greenhouses. For windows placed up to your fourth floor, we use water-fed extension poles. This technique is convenient and allows safe cleaning systems – the poles are attached to the water reservoir in the van. For high-rise window surfaces, our rope access team will grant you fast and great end results. You can benefit from these services right now – just ring 020 3746 3113 and place an order! You will appreciate the perfectly looking office with the help of the experts of commercial window cleaning. You can rely on our high end services for all kinds of business premises. For example, if you have a small shop, we can carefully clean its windows by using water fed extension pole tools – it gives us the chance to as high as the fourth floor. If you search for spotless look for the glass panes of a skyscraper in London and the neighbouring areas, we will put in use our rope access gear. In any case, you will appreciate excellent results right away. 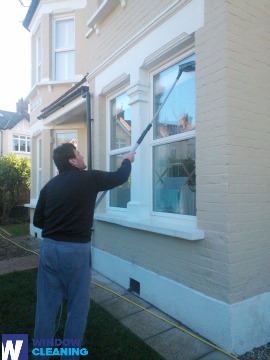 Benefit with our prompt and professional domestic window cleaning in Charlton. We clean the windows of your home both inside and outside. The solutions we use are eco-friendly - you will love the perfect results and be ecologically responsible. Moreover, we use only purified water. Don't wait, dial 020 3746 3113 and order our top-notch services. Our customer representatives will guide you – they are on-call 24/7. We have other ways of booking – our request a cleaner online form or just chat with our customer care assistants.